The amount of pasta I'm eating at the moment is ridiculous. It's always been one of my favourite foods, but I've been having a bit of a love affair with it again recently. So much so that I've half-considered renaming this blog "The Pasta Diaries", though I'm sure followers would fall away thick and fast if I offered nothing but pasta. When I first started this blog, the ethos behind it was (mostly) quick and easy meals that you could make after work. Pasta definitely fits this bill, and this recipe is ready in the time it takes to roast the tomatoes. Not quite a Jamie's 15 minute meal, but nearly. If like me, you always keep frozen chopped shallots and frozen parsley in stock (don't judge, they're a lifesaver when strapped for time), you can almost entirely make this as part of a fridge/cupboard raid. 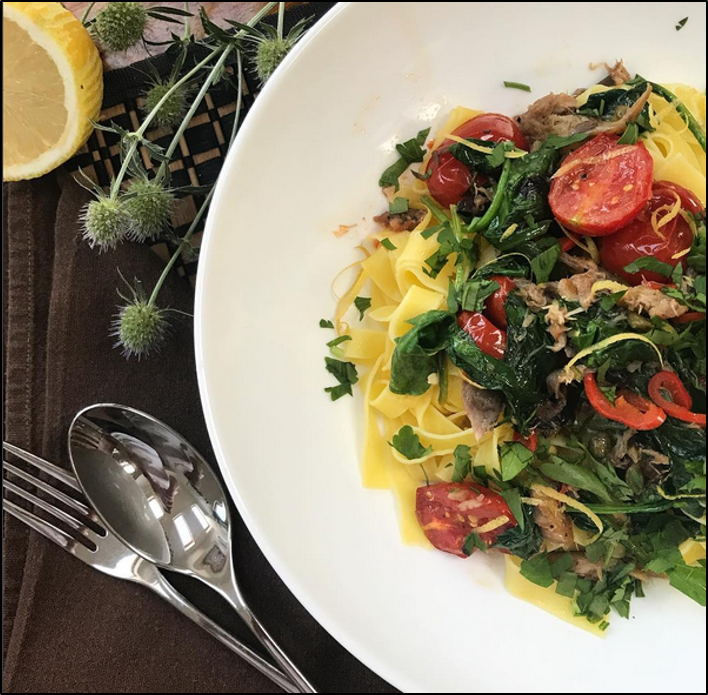 I nearly always have cherry tomatoes in the house, and you can easily substitute fresh smoked mackerel for tinned, leaving off the spinach. Fresh is always nicer, but sometimes needs must. First, pre-heat the oven to 180 degrees and roast the tomatoes on a baking tray for 20-25 minutes, then put a pot of salted water on to boil. While the tomatoes are roasting, sauté the chopped shallots in the olive oil alongside of the chillies until soft. Add the crushed garlic and cook for a further couple of minutes. Add the wine, capers and olives, turn down the heat and reduce the sauce by about 50%. Once the tomatoes are done, add the fettuccine to the boiling water (I used the posh DeCecco egg stuff which takes 4 minutes) then wilt the spinach into the sauce. Add another glug of extra virgin olive oil, flake in the mackerel fillets (discarding the skin) then carefully stir in the tomatoes so they don't break up. When the pasta is ready, drain and divide between two bowls. Spoon the sauce on top and scatter over the lemon zest before finishing off with a good squeeze of lemon over each bowl. Garnish with chopped parsley and then gobble down this super quick and easy dish while hot.